Definition - What does Standing Hand-to-Toe Pose mean? Standing hand-to-toe pose is an intermediate balancing asana, which requires strength, flexibility and balance. To enter the pose, begin standing on a yoga mat in mountain pose. Lift the right leg and, bending at the knee, catch the toes of the foot with the right hand. Mindfully straighten the right leg out to the right side. Keeping the hips even and shoulders squared forward, straighten the upper body. The crown of the head and spine lengthen while the gaze is to the front. Breathe for a cycle of three to six breaths, lowering the leg to come out of the pose. Repeat on the opposite side. 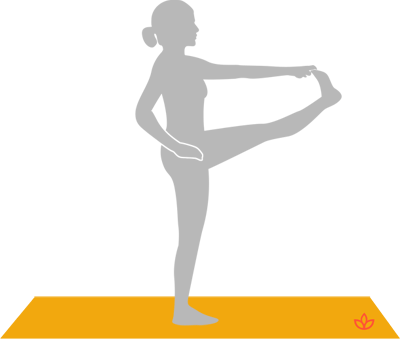 The Sanskrit name for standing hand-to-toe pose is hasta padangusthasana. As flexibility increases, the yogi can attempt to move deeper into the pose by holding the extended foot with both hands and touching the forehead to the shin. To modify this asana, keep the lifted leg bent. A wall or yoga strap may be used for support and added stability.